Carbon steel is not limited for casting, it can be also used for forging. In forging, we generally name this kind of material as forged steel. Material grade of carbon steel used for forged clamp straps is AISI 1045 steel. Why use AISI 1045 steel for forged clamp straps? AISI 1045 steel is characterized by good weldability, good machinability, and high strength and impact properties in either the normalized or hot rolled condition. AISI 1045 steel has a low through-hardening capability with only sections of size around 60 mm being recommended as suitable for tempering and through-hardening. However, it can be efficiently flame or induction hardened in the normalized or hot rolled condition to obtain surface hardnesses in the range of Rc 54 - Rc 60 based on factors such as section size, type of set up, quenching medium used etc. AISI 1045 steel has good machinability in normalized as well as the hot rolled condition. Based on the recommendations given by the machine manufacturers, operations like tapping, milling, broaching, drilling, turning and sawing etc. can be carried out on AISI 1045 steel using suitable feeds, tool type and speeds. Thus, AISI 1045 is subjected to the forging process for forged clamp straps. While heat to 850°C - 1250°C (1562°F - 2282°F), and hold until the temperature is uniform, then cool in furnace. Due to the usage of clamp straps, forging is recommended for producing clamp straps. Here the forging we referred is closed die forging process. Closed die forging is a forging process that specially for small metal components, which could be replaced by casting. In closed die forging, we will first develop a pair of forging dies according to the 3D dimensions of forged clamp straps. Material used for forging dies is tool steel, also it needs to be CNC machined, so the tooling cost is relatively higher, normally between 2000usd-3000usd. After preparing forging dies, before forging, we will choose raw material in proper diameter according to the shape of clamp straps, and cut to a certain length. Because of hot forging, so it will be heated for easily shaped. Next, place the heated bars between upper and lower dies and press to desired shape under high pressure. Finally, remove the flash ( we call this process trimming) and shot blasted to get final shape. 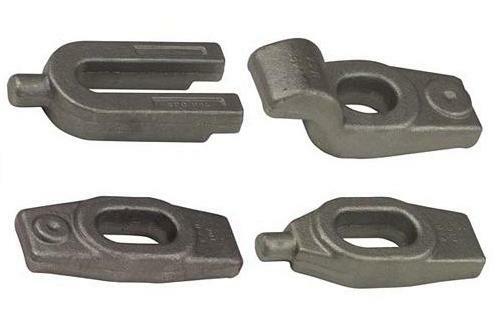 The heat treatment of forged clamp straps plays an important role in developing the desired properties such as the relieving of internal stresses, the refinement of grain structure, and the attainment of improved mechanical and physical properties. Fly Forge supplies forged clamp straps in required heat treated condition. The forgings may then be quenched and tempered to achieve the final desired properties. Contact us to learn about the value added heat treatment processes for products available at our company. Machining is another value added service that we can supply for our customers, so once cooperating with us, we can offer you finished components directly. Black oxide or blackening is a conversion coating for forgings. This kind of surface finish is used for forged clamp straps to add mild corrosion resistance, for appearance and to minimize light reflection. To achieve maximal corrosion resistance, the black oxide must be impregnated with oil or wax. One of its advantages over other coatings is its minimal buildup.